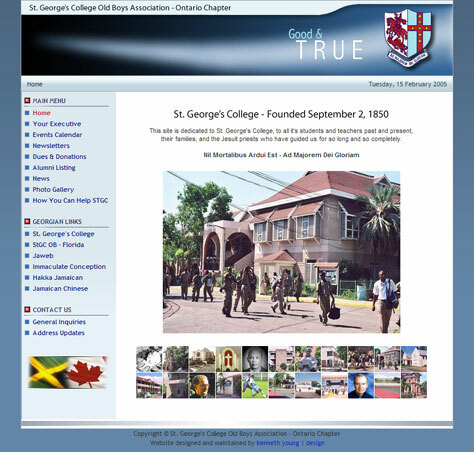 St. George's College is one of the most prestigious schools in Jamaica. Its alumni association is an incredibly active organization, with events attended by hundreds of alumni and their families. They wanted a website that was intuitive, and would allow them to easily add new content and archive older content. They wanted members to be able to pay dues, submit address updates, and view photos from past events online. We implemented an open-source CMS (Content Management System) that provided all of this functionality at a reasonable cost. Click here to visit the site. "Kenneth Young Design’s expertise was evident throughout the development of our new CMS-based website. They interpreted our ideas perfectly and helped us make the website’s navigation and layout more intuitive. They suggested features that made the website easier to update and more interactive. Communication was second to none, and changes were made with minimal delay. I doubt you’ll find a more capable or responsive company in Toronto!" Let us know what you want from your website, and we'll give you a free quote. There is a wide variety of high-quality open-source web applications available for commercial use completely free of charge. These include content management systems (CMS), image galleries, e-commerce applications, discussion forums, guestbooks, and others. Many of these applications are very robust, scalable and feature rich, and are on-par with (and sometimes better than) expensive "professional" packages. Open source applications are easily customized to meet specific requirements, and many are supported by large developer communities. Basing a website on an open-source application instead of building one from scratch can save time and money, and result in a better website.